Today we have here, Allen Gannett. He’s the Chief Strategy Officer of Skyword, founder of TrackMaven, which is a big data analytics company; and he’s also the author of “The Creative Curve“. A book that I loved and I suggest everyone reading it. And today we’re actually going to explore with Allen, the insights about creativity, how it works. And also the misconceptions we all have about how creativity works. So thank you for being with us today Allen. Allen: Thanks for having me man, and there’s a lot of misconceptions, so we have a lot to talk about. Gennaro: I had a lot of misconceptions about creativity before reading your book as well. So probably would be nice to start from there. What’s really creativity? What have you been finding from your research? How does The Creative Curve work? How does The Pointe of Cliché work? What drove you to study creativity in the first place? What’s the main difference between the Creative Curve and the Technology Adoption Curve? Why did Facebook succeed even though it was not the first mover? Do you have any kind of preference when it comes to business modeling? Who is your favorite business person? Do you have any other suggested reading? Allen: the funniest thing to me about creativity is how much the definition has changed over time. One of the things I talk about in the book is this sort of idea of the artist over time and how they were seen in the ancient era. Artists were viewed as people who just sort of imitated God. And then in modern-day creativity, a new concept emerged. It was during the Golden Age, which was also Golden Age from the capitalist perspective. There was an influx of money, people could afford art, they wanted more art, supply and demand kicked in. And artist started being able to command more respect. There started to be for the first time, this celebrity artist and this notion of the creative as this sort of masterful persons would emerge. You know we also sort of developed over time these other notions around creativity of, it was people are sort of semi-divine or they’re weird, or they’re odd and heroic, but at the same time they’re sort of wonderful. And what’s interesting is when you look at the science around creativity, there’s actually a lot of consensus about how it works. So, the short version is that creativity is the ability to create things that are both novel and valuable. It’s not just about novelty, which is just creativity, really. It’s not just about value. It’s about creating things that are both novel and valuable. That’s because our brain relies on the right hemisphere, which is very good at connecting new and different ideas together. Therefore, it’s not some magical force. It is a pretty normal biological process. We’ve studied it, we’ve observed an MRI scan. And it’s something that’s actually quite explainable. Allen: when it comes to creativity, there’s sort of three elements that I think are important. So, one is technical skill, so having the technical skill in your field. Two is the marketing distribution. So being able to actually get your ideas out there. And the third is the timing. And I spend a lot of the book, around timing, and I call it the Creative Curve as sort of the framework that I use. The Creative Curve isn’t new, it’s a pop-psychology version of a pretty serious academic concept. That is called the Inverted U-shaped relationship. This theory finds that a rate of exposure to something, how familiar we are with something, it has a pretty big influence on our perception of it. And the relationship between familiarity and preference is an upside down U. And that’s the creative curve. Where when something very new, when something very unfamiliar, we don’t like it that much. But then as we’re exposed to something more, like think about the first time you hear a new song; you’re like “oh, this is actually pretty good, I kinda like this.” And then you hear over and over again and it becomes familiar. That’s because we don’t actually like things that are erratically new. Think about if you watch a movie that is nine hours with no protagonist like you’d be terribly bored. Like, Star Wars was a western in space. It’s actually, it turns out the ideas that tend to the best are the ideas that are familiar enough to be comfortable but yet still novel enough to be interesting. 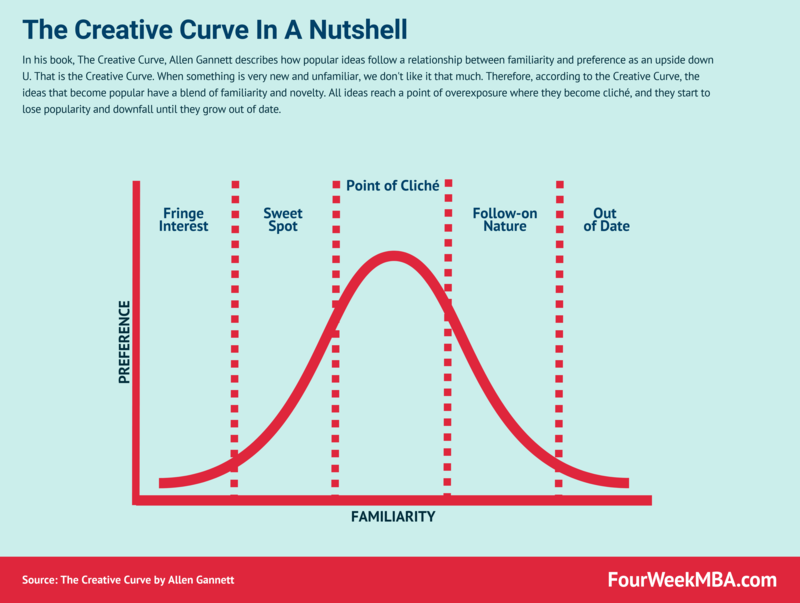 And so the creative curve is this relationship between familiarity and preference which basically shows this, this sort of increase where the ideas that tend to take out and quickly jump into popularity are the ideas that have a blend of the familiarity and novelty. Now eventually, all ideas reach a point of overexposure where they become cliché and they start to lose popularity and that’s sort of the downfall. And so, when you talk about creative genius, we’re really talking about is the fact that there are some people out there who have this really artful ability to create things that are in that sweet spot of the creative curve, where they’re familiar enough to be safe to approach but novel enough to be interesting. Where at a population level, you know, there are ideas that are comfortable enough that people want to check it out; as more people get exposed to it, they’re more interested and they can quickly build in popularity. That’s what creative genius really is; it’s not, you know, divinity, it’s just sort of timing. Allen: Yes! What’s interesting is also, you’re basically this creative curve, you should look at the rate of exposure which affects peoples perception of it. Indeed, the frequency of exposure obviously sets the rate at which things move through the curve. So social media is really interesting because since the unit of content is very small, people rate of exposure is quite high. For instance, memes on Twitter, literally change within hours or days and brands get in trouble because, you know, there’s some meme and a week later they create some rift on the meme but by then it’s actually too late. One of the things you’re seeing I think is interesting for entrepreneurs and for marketers is, you’re starting to see this pivot away from such short-form of social media to more long-form, experiences and contents. You see brands, for example, starting to create mini-documentaries or movies, or TV shows because of this arms race within social media to stay relevant because your acting is going through that creative curve so quickly. Gennaro: Yes! There was actually an interesting Tweet from LUSH to quit its social media accounts, because, they’re going to manage the interactions with their community on the channels they have control over. That was very interesting also from my perspective, I mean, I’m more on the content writing side as my main channel of communication is blogging. To be successful in blogging as well, you need to create great content, which is highly researched, and curated, and this requires a massive investment. The creative process is not easy at all. I mean, it’s really something that you need to master overtime! Let me get back to you, what drove you to study creativity? I mean, what I like about you is that you are a practitioner, you have been CMO, founder of a company, and now you’re a chief strategy officer. So I guess it’s really interesting in seeing your works in the real world. Allen: Yeah, I was running my company, which in October, we merged with another company. My company worked with a lot of big brands. Those comprised names like GE, Dollar Shave Club, and the NBA. And all these sorts of iconic, you know, and modern brands. And what was interesting is that even at those brands and even more so in smaller brands, you hear people say things like, “I’m not that creative.” And I have always been a big believer in human potential and a big believer that you know, a lot of life is about nurture; not about nature. And that was just from how I was raised. I think just, I was conditioned that way. And so I would get really frustrated when I would hear this from people. And I Heard a lot of negative self-talk. And I started digging into it and I started, reading about it, and I found there was a lot of academic consensuses that creativity can be earned. So I started giving a speech that was sort of the microcosm of the book. All about the myths of creative genius and how if you look at stories of people like Mozart, for example, it’s not actually the story of someone who woke up playing the piano, it’s actually the story of a little kid who had a father who applied conditional love, and made him practice three hours a day from the age of three, seven days a week. Right? And so I started giving this speech and it really resonated and it sort of snowballed into the book where I just realized that it was a lot to unpack here and I think they’re so much potential that is limited by the things people told themselves about creativity. Like, “oh, like, you know, I’m too old to learn that skill.” I mean all this crazy stuff and the reality is we’re entering an age where creativity is the most future proof skill. Gennaro: Its the only thing that cannot be automated (yet)! Allen: Yeah, exactly. And they do these experiments in AI and they’re trying to make AI make art and its kinda crappy. Gennaro: interesting point. For someone that has read another book, which is “Crossing The Chasm,” which is a classic book for high-tech marketing. It might be easy to confuse the creative curve with the technology adoption curve. But those are two different concepts right? Allen: So the technology adoption curve is basically showing how something goes from 0% usage to 100% over time. And that’s especially relevant for things that are commodities or utilities, right? So think about a hard drive processor. What I’m talking about, anything that has an element of preference. Things that rely on preferences come in and out of preference. And so the thing that’s interesting is that things go in maybe 0% popularity up to let’s call it 80%, and then go back down to zero or close enough to zero! Versus with commodities and utilities, things go to 100% and often stay at 100% until something completely replaces it. And so that’s the big nuance or difference. Gennaro: Nice, so there is also another misconception business which is about the first mover advantage. In your boo,k there’s an interesting case that you mentioned which is about the first mover in the social media space. Which was not Facebook, even though many people think it was Facebook and actually how they disappeared. And you have a sort of theory? Allen: So, I think this is so important. I think entrepreneurs make this mistake, all the time. And that’s the mistake of thinking that the best features win. Or the highest quality features or the most advanced features win. That’s not true. The companies that win, have the right features at the right time. Let me explain what I mean. In the book, I give you an example of CampusNetwork versus Facebook. So CampusNetwork was a social media network that launched a month before Facebook at Colombia University, another Ivy League school. It also went viral on campus, became hugely popular. The founders also took off from school to try and scale, and they were very smart and capable. And for a while, you look back at the articles from 2004, it was sort of framed as this war on campuses between CampusNetwork and Facebook (you can read the article here: “is there room for more than one?”) on who would have won each campus. That was the big thing. And what interesting is that CampusNetwork was actually more advanced. It actually had more features; it had things like photos, activity feed, news feed, groups. All these things that would come into Facebook much, much later, Campus Network had. But, here’s what’s interesting, the audience wasn’t ready for that. Part of why Facebook won is that Facebook was simpler. So, in 2004 we were just making this transition from using screen names and pseudonyms online, this idea of using your first name, which at the time was crazy, right? That was the jump people were making, that was the jump people were comfortable with. They weren’t yet comfortable with the idea of broadcasting all of their activity with everyone constantly. Like, now, we sort of assume that’s like it has always been. And so Facebook was the right idea at the right time. It was the right features for the right audience. So often times entrepreneurs, because we’re early adopters because we’re product obsessed, we sort of say, this is the product with the best features, this is what people want. And often, people actually just want simpler features. Features that are familiar enough to be safe and approachable, but yet have a novel twist and have something intriguing that they want to check out and explore more. Gennaro: I know this process because I also work in a tech company and its very easy to get in love with features or products rather than understanding what features people are used to or actually are using within your product. Also, when it comes to business modeling, creativity is very important because you need to be able to mix all the pieces together with the right timing. Allen: Yes, one of the things that I like to focus a lot on is the interactive aspect of creativity, and we have this image of creativity as a writer goes to the writing cabin, six weeks later comes out, a finished novel, boom. In reality, the majority of highly successful creatives are very, very interactive. And that’s because they realize that their job is to create an experience for the audience, they don’t actually create for themselves. That’s something that people who are not that successful at creativity say. Actually, if you look at Andy Warhol’s interviews or all this stuff they’re created for an audience, that interaction, that audience-artist interaction, that’s what’s really interesting to them. And so as a result, they know that, and they try and get feedback from their audience early and often in the process. Right, so that could be an example. Think about a standup comedian, you know standup comedians, by the time that they are doing their Comedy Central special, or whatever, they have for years been working out those jokes and mic nights and open mic nights at small clubs. This is why big comedians go to small comedy clubs to try out jokes because there’s this sort of iterative element of working through the joke, getting it to that perfect place where the audience likes it, right? It’s not about you the creator, it’s about the audience. So I think when it comes to business models, the thing I’d say is how can you incorporate audience feedback, early and often. Cause otherwise, you’re just creating for an audience of one and that not a good market. Gennaro: absolutely I totally agree. In order for a product to work, even months before the product is ready, you need to gather your audience feedback. Allen: my favorite business book is, “The Hard Thing About Hard Things” by Ben Horowitz. He does the best job I think of talking about entrepreneurs in a very practical way. He has a chapter on how do you fire your friends. Like, which is a real problem when you’re running a startup. I’d say, he’s definitely probably, the most influential business person for me right now. I reread his book every six months. And I think it just should be mandatory reading for anyone who’s trying to build a company. Allen: a great compliment to my book is Ed Canellas book, “Creativity Ink” which is all about Pixar, and so there’s a chapter in my book about Ben and Jerry’s, and there’s a lot of parallels to what Ben and Jerry’s does in innovation cycle and what Pixar does and I think if you read both books, you have sort of a framework. You know the short version of what Pixar does is so interesting is their product is not actually movies. Their product is their creative process, that’s the thing they iterate. That’s the thing they innovate on and that sort of mindset. I think it is interesting and so that’s definitely a good pick up if you’re interested in space. Gennaro: interesting! Thank you very much. Anyone should be reading your book, The Creative Curve, as it makes you understand the real nature of creativity. So thank you for having joined us, Allen! You can connect with Allen on LinkedIn. Allen: Thanks for having me!